SEOUL, Oct. 10 (Yonhap) — The world’s top two female golfers will play together this week in the opening round of the only annual LPGA tournament in South Korea. Park Sung-hyun of South Korea and Ariya Jutanugarn of Thailand, ranked Nos. 1 and 2 in the world, will be in the final group in Thursday’s first round of the LPGA KEB Hana Bank Championship at Sky 72 Golf Club’s Ocean Course in Incheon, 40 kilometers west of Seoul, the tour announced Wednesday. They’ll be joined by the world No. 8 from Canada, Brooke Henderson, at 10:40 a.m. on the first tee. Park and Jutanugarn, the only LPGA players with three victories in 2018, faced each other in the singles at the UL International Crown, an LPGA team competition, last Sunday, also in Incheon. Jutanugarn prevailed by the score of 2&1, but Park got the last laugh as South Korea won the championship. Park is the reigning LPGA Player of the Year and money winner, but Jutanugarn is leading in both categories this year. 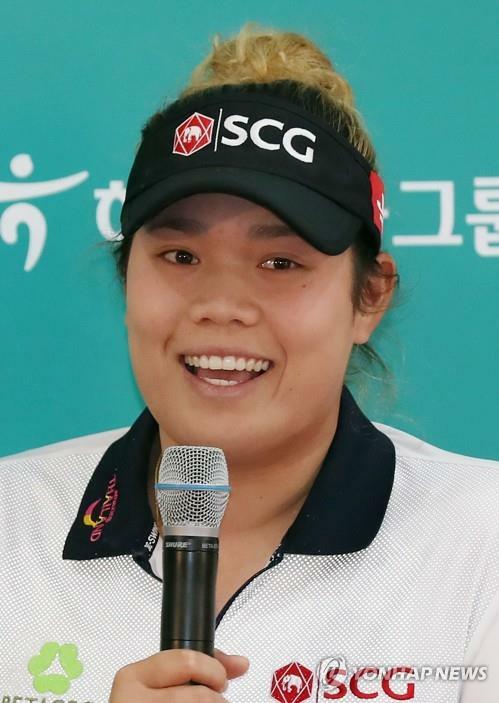 Jutanugarn has made a little over US$2.2 million in 2018. Henderson, with two victories, has earned $1.3 million to rank second, followed by Park at $1.2 million. In the race for Player of the Year, Jutanugarn has 198 points, 71 ahead of Park. Henderson is in third at 110. The penultimate group, teeing off at 10:29 a.m., will feature the past three champions: Ko Jin-young of South Korea (2017), Carlota Ciganda of Spain (2016) and Lexi Thompson of the United States (2015). At No. 5, Thompson is the third-highest-ranked player in the field this week behind Park and Jutanugarn.